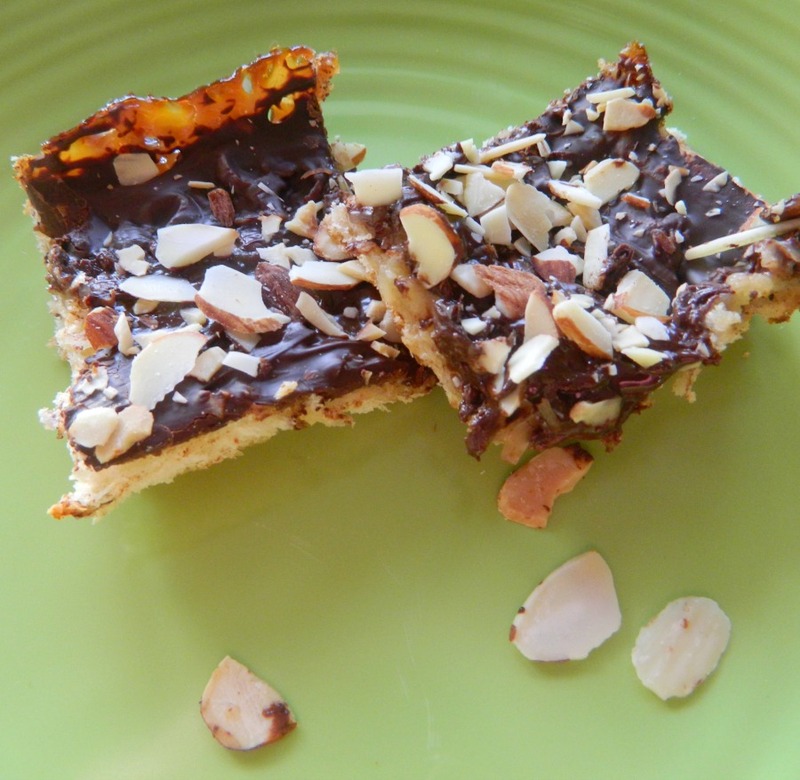 These Simple Chocolate Coconut Almond Bars are really easy to make using a tube of crescent rolls. They were sweet and salty and oh so delicious. Bake up a batch and enjoy every bite! I came across a similar recipe like this one a few years ago and stuck it in a cookbook and that was that. I just found the recipe and made it tonight changing around a few things. These were a big hit with my kids and hubby. They would make a good dessert to bring to someone’s house — they cut nicely. So give it a try! Preheat oven to 375 degrees. Have a 13 x 9 baking pan ready and lined with parchment paper. Then spray the paper and the sides of the pan with a light coating of cooking spray. Unroll the crescent rolls and spread out in baking pan while sealing up perforations. Try to spread so that you can make the dough reach the edge and have the dough be able to go up about 1/4 to 1/2 inch up the edge of the pan. Don’t worry if it doesn’t look perfect. It all comes out fine once the filling is over the dough and you bake it. Sprinkle the coconut over the crust. Open the can of condensed milk and mix the vanilla extract in gently. No need to clean another bowl for this step! Now drizzle over the coconut. Bake 15-20 minutes turning half way through until the edges are golden brown and filling is set. Cool the pan on a cooling rack for at least 15 to 20 minutes. In a microwave safe bowl, melt the chocolate chips for about 25 seconds. Take out. Stir. Put back with the peanut butter for another 25 to 30 seconds. Take out. Stir until smooth and creamy. If you have to put back in microwave to completely melt and have the mixture smooth, only do this for another 10 to 15 seconds. 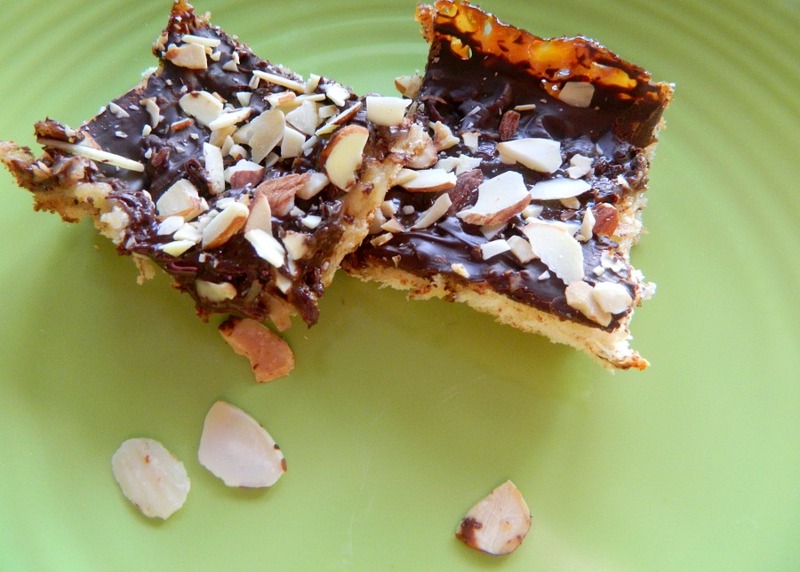 Spread chocolate mixture over the bars and sprinkle with the toasted almonds. Place in fridge until chocolate is set. At least 35 minutes. You can now cut the bars. These need to be stored in the fridge. When serving, you can set them out on the counter for a while but if there are any leftovers (but I bet there won’t be any) store back in the fridge. Now go and ENJOY these yummy bars!